You finally get time for that big sweater project, but winter is almost over! Well, the very same thing happened to me so I worked with the amazing Hobium Yarns to create this free spring cotton sweater pattern. It’s perfectly light enough to transition with you from winter through spring while using large enough (6mm) needles that you won’t be stuck with a forever project. 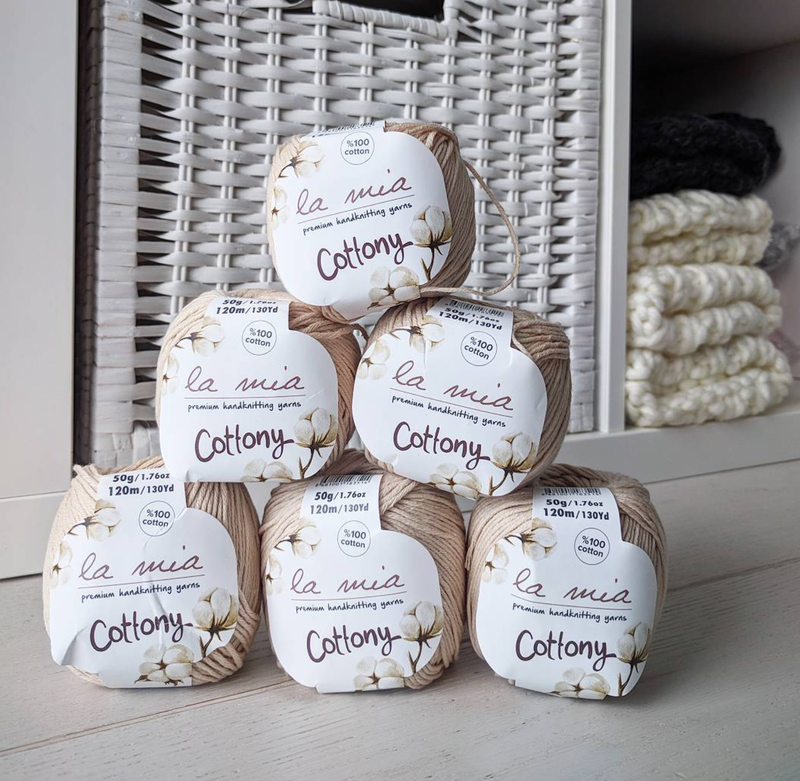 You’ll need about 840 meters (910 yards) of DK weight (category 3) cotton yarn like La Mia Cottony from Hobium Yarns. For Large and Extra Large sizes, add 120m (130y). 6mm (US 10) circular needles. All pieces are worked flat but I used a 24 in circular cord length to accommodate all the stitches. You’ll also need a tapestry needle to seam it all together. Gauge is 17 sts x 24 rows on 4x4in swatch. This simple sweater design is made in 4 parts: A front piece, back piece and two sleeve pieces all worked flat and seamed at the end. You may choose to slip the first stitch of every row. It depends on how you’d like to seam your project up later. I slipped the first stitches but I think it might have made seaming a little trickier. It’s totally optional. To begin, cast on 70-76-82-88 stitches. Afterward, (row 19) grab another ball of yarn and work double stranded, using two strands of yarn at a time for a doubly thick material. Continue in pattern, repeating rows 1-6 six times total while holding the yarn double stranded. Then, work rows 1-6 again 3 times, while holding the yarn single stranded once more. My tip for this part, is to keep both strands of yarn attached from before, and alternate using one or the other every other row. That way, you can carry both strands up the work so you can work double stranded again later. After you work three blocks of the pattern single stranded, start working double stranded again. Work in pattern for three blocks (rows 1-6 three times). At the beginning of the next row (row 91) work 3 knit two together decreases in a row for arm shaping. Knit up to the last 6 stitches and work 3 SSK decreases in a row. Work one k2tog decrease and one ssk decrease at the beginning and end of each of the next two right side rows. Purl the wrong side rows. Continue in pattern (making sure to knit the next “row 6” row) and complete two more blocks of the row 1-6 pattern double stranded. You’ll have a total of 6 pattern blocks (36 rows) of double stranded knitting for this part. Now, work single stranded (no need to carry both strands up the side) for 5 rows (11 rows for Large and Extra Large). For the 6th (12th) single stranded row, Knit 15-17-18-20. Put those stitches on hold, and bind off the next 30-32-36-38 stitches. Then knit the last 15-17-18-20 stitches. Work in pattern, with the stitches remaining on your needles for a total of 12 rows (two blocks of pattern repeat) and bind off. Repeat with the stitches you put on hold. For the back piece, simply cast on the same number of stitches as for the front piece. Work single stranded only for a total of 21-21-22-22 pattern repeats (126-126-132-132 rows). Just make sure to complete the same arm shaping decreases at row 91 (beginning of pattern block 16). Repeat rows 1-8 two more times. Then,K2tog at the first two stitches and SSK the last two stitches of every other row for 6 rows total while continuing in pattern. Then, switch to decreasing only every other RIGHT SIDE row (so every 4 rows) until 34-36-40-43 stitches remain. Then, continue working in pattern without increasing or decreasing for 2 pattern repeat blocks (16 rows). To begin the increase sequence for the ruffle/bell sleeves, start by increasing (method of choice) 3 stitches evenly across row 81 (rs row). Now, I don’t pride my self on my excellent seaming abilities. So the loose stitching of this fabric with the larger needles and the finer yarn had me go through a little trial and error with the seaming. I eventually found that the invisible vertical stitch for stockinette worked for me. It provided the strong seam this fabric needed to keep the edge stitches from looking too loose. If you didn’t slip the first stitches, you may find that an edge to edge seam works well. Here’s a link to a great seaming article from Vogue Knitting with many stitches you can try and see what works for you! Either way, it all adds to this sweater’s one-of-a-kind rustic charm. I started by seaming the shoulder seams bind off to bind off and then seamed the sleeves on with all the pieces laid out flat. From there, you can just seam up the sides and seam the sleeve edges together. A quick wash and dry on low heat evened out some of my wonky stitches and finished off this sweater nicely. 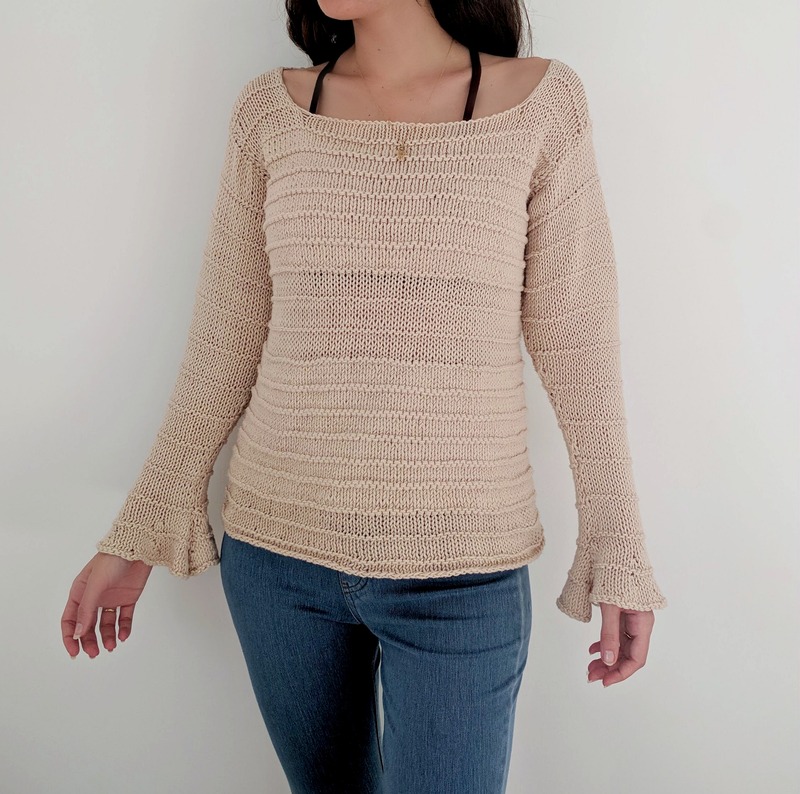 I hope you enjoy this pattern as much as I enjoyed making it for you and be sure to check out Hobium and their amazing selection of cotton yarns!